Stephen Frear’s perceptive film starts with the moment in May 1997 when millions hoped major change was on the horizon, as the Tories were swept from power in New Labour’s landslide victory. The Queen is shown following the election results, and preparing for her first meeting with the new PM and his republican wife. Her secretary explains that Blair is essentially “one of us”, conservative father, educated at Fettes: “I believe he was tutored by the same chap as the Prince of Wales,” he says. “Well we won’t hold that against him,” the Queen replies. A few months later, the death of the Princess of Wales brought an unprecedented public reaction against the establishment. There were plenty at the time who dismissed the mass reaction as “just hysteria”. In the film this is the reaction of the older royals, who remain determinedly at Balmoral, with Prince Phillip dragging the boys off out to hunt stags to keep their minds off their mother’s death. But Frears is better than most at showing how empty of content the “just” word is. Things are never just what they seem and the film brings out very well what a pivotal moment it was, with a growing republican sentiment and hatred for an establishment that many blamed for hounding the princess to her death. Millions of people began to wonder what the point was of this strange, cold and aloof institution, whose members didn’t even care when a young member of their family died in a road crash. The Blair camp were equally amazed at the monarchy’s total inability to respond or relate to their world of image and spin. Cherie Blair is shown speculating about the underlying possibilities of the mass reaction. 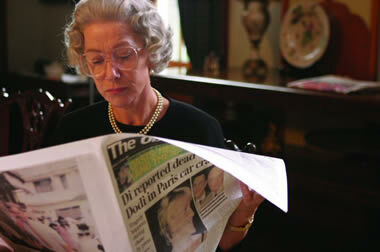 She receives a sharp rebuke from her husband, who says that an end to monarchy is unthinkable. It was certainly a moment when Blair’s popularity stood so high that he could have proposed a major constitutional change and millions would have supported him. The film’s dramatic turning point comes when he is looking through notes made by staff for his first speech as Prime Minister to his party conference. They have him saying that he is ready to bring about a revolution in Britain. “Revolution,” he shouts. “Who wrote this?” The word, innocently inserted by a bunch of New Labour hacks with no more commitment to actual revolution than Blair himself, nonetheless sends him sprinting to the telephone. He insists the Queen come to the telephone, and tells her in no uncertain terms that the royal family must return to London at once, fly the flag at half mast above Buckingham Palace and that she must make a televised statement to the nation. He has concluded that his role is to save them from themselves. The establishment have a lot to thank Blair for. Not only did he do all he could to rescue the Royal Family from richly-deserved oblivion, but his policies have breathed life back into the rotting corpse of the Tory Party which many hoped had received the coup de grace in 1997. At the end of the film the Queen is shown warning Blair that he should prepare himself, because there will come a moment when he too will wake up to the realisation that people have changed, and started to hate him. Frears’ film is about change, how things that seem immutable suddenly begin to disintegrate. It is also an eye opener on the hidden British constitution, with its murky relationship between head of state and prime minister. The film abounds with excellent performances. One feels sorry for Michael Sheen, such a convincing Blair for the second time in his acting career that he runs the risk of being typecast. Robert Cromwell is a good Duke of Edinburgh, and Helen Mirren is superb as the Queen – though Mirren is probably rather brighter and Cromwell probably not so nasty as the real things!